Who ever said all crabs were bad. 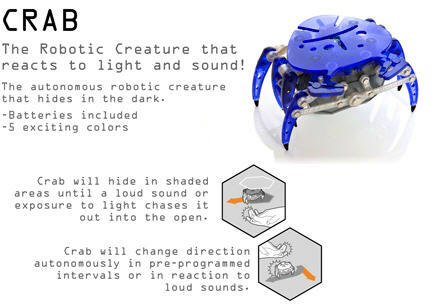 Insect Kits have a new breed of the hexbug crab that will not pinch you or bite you. No need for band aids. This guy reacts to sound and light just like a real creature of the sea. Available in 5 different colors Turquoise, Red, Green, Blue or Black of the insect Kits Hexbug Crab. We love the Crabs by Hexbug. These guys like to stay in shady areas and will run to another spot when they hear loud noises.